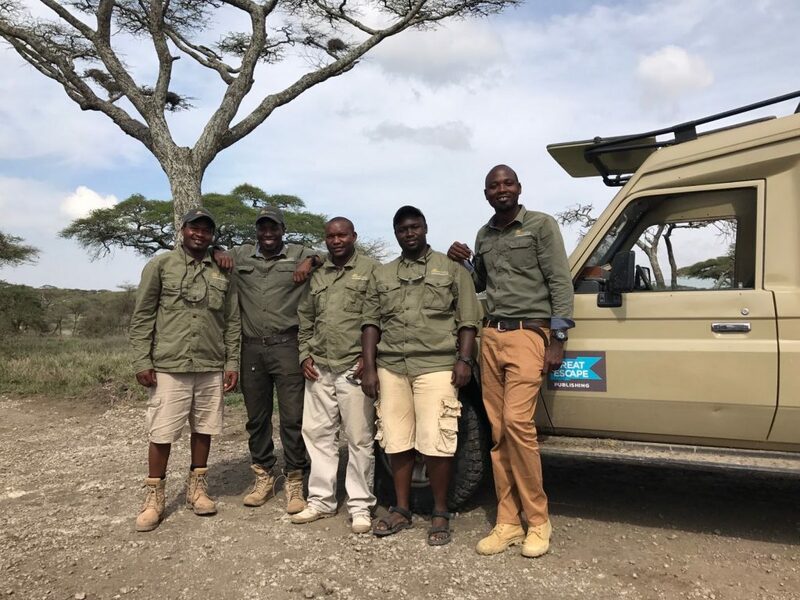 If our dates don’t work for you – or you’d like to arrange your own, private safari – we’re happy to introduce you to our team on the ground in Tanzania. They can hook you up with guides, vehicles, and (sometimes) group discounts to ensure your itinerary includes the most photogenic spots and roads only the locals know. In Africa, scams are plenty. To avoid them, our guys will pick you up at the airport and handle all your reservations. The only thing they can’t arrange is your flight. 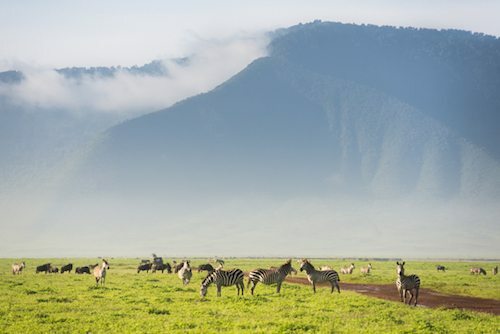 Tanzania is most known for its huge herds of animals, its vivid landscapes, and the country’s desire to keep the wildlife wild. You won’t find many (or any) opportunities to touch, ride, sleep or play with animals here. Cheetahs aren’t trained to jump on your car and giraffes aren’t trained to stick their head into your dining room. What you’ll find instead are vistas dotted with thirty or more elephants… plains with wildebeest and zebra by the thousands as far as the eye can see… landscapes so beautiful you’ll feel like you’re in a painting… and sunsets so spectacular you’ll be hard-pressed to find another area of the earth like it. Unlike South Africa and Botswana, your guide stays with you from camp to camp. He drives you from park to park and also on safari inside each park. We hit the jackpot with these guys and I’m happy to pass along their contact details. Before leading safari tours, our guides learned all the ins and outs of Tanzania’s wilderness by working in camps that follow the great migration. Today, they use their expertise to show you the best locations for viewing wildlife and landscapes – areas that most tourists never get to see. Not only do they have extensive training and knowledge of all things wild – mammals, birds, and insects alike – but they’re also well-versed in photography. They know exactly how to position the vehicles and find the best light, so you have the greatest advantage for capturing stunning images. Tell them you’re with us and they’ll take you to all our best photo spots – roads they’ve assured me no one else knows about. Most of the top photographers in the world use these guys. Some will tell you they’re the best in all of Africa and I believe that. In my travels through South Africa, Botswana, Tanzania, and Namibia, I’ve worked with 30 or more different guides, and never have I found one better. I have no doubt they’ll take good care of you, and that’s important when you’re in a country so far from home. 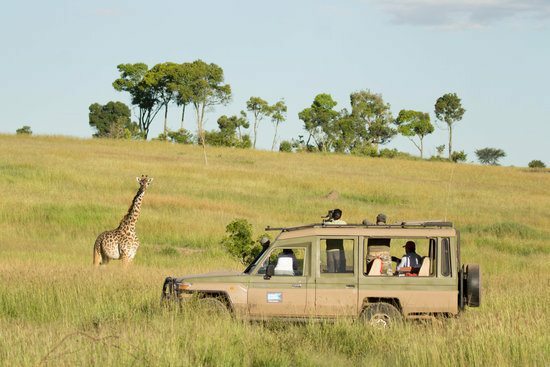 Unlike safaris in other parts of Africa, you’ll be riding comfortably in closed cars. Not the open cars you see on safari in South Africa and Botswana. These closed cars are required in most parks by the Tanzania government because, again, Tanzania is making every effort to keep the wild animals wild. Your car will provide heat and air-conditioning, cover in the rain, added protection from the sun, shield you from dust (which is a big deal in the Serengeti), and most importantly…give you the freedom to move about for your photography. All photography is done through the roof and side windows with beanbags to support your lens instead of tripods or car mounts that restrict mobility. Unlike open vehicles, in closed cars you’re free to stand on the seats, squat in your chair, and move about the car as desired, ensuring the best opportunities to capture any shot. They are also equipped with charging ports for your electronics. Lots of things affect the price of your tour – the level of luxury you ask for, the number of days, the number of people in your group, the season in which you’re traveling, the areas you’re going to visit, and whether you need in-country airplane tickets to get from one place to another…. May and November are good-value times to schedule a tour. December through March are peak migration months, and June through October is high season. I like February because the landscapes are magical when the grass is green and the skies are blue. It’s also the best time to witness the great migration. Each year, nearly 1.5 million wildebeest, 400,000 zebras, and 200,000 gazelles chase the rain across the vast Serengeti grasslands in their endless quest for survival, making February the best time to see the circle of life and death in the wild. The great migration also coincides with peak calving season for these large herds of wildebeest. With thousands of young birthed each day, a host of predators are attracted to these migratory areas of the Serengeti, making it the perfect place for viewing lions and big cats like leopards and cheetah in action. I also like November because you can do more for less money – step up your level of luxury a little. 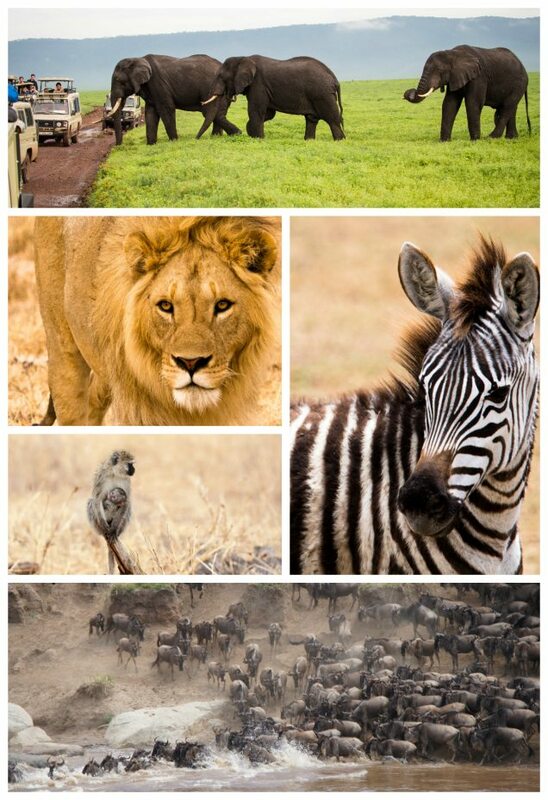 High season (June through October) will always be the best time for Safari, which means higher prices and more crowds. But our guides know exactly where to go so you see the most amazing things without the imposition of other Jeeps. During this time of year, as the great migration continues north, animals tend to congregate around watering holes and rivers, setting the stage for a pristine viewing of predator-prey interactions in the Serengeti. Among landscapes filled with lush, rolling grasslands and rocky kopjes, this is also the best time to witness the breathtaking scenery as thousands of wildebeest thunder across the Mara River. All things considered, expect $8,000 or more for a 9-day itinerary. Could be more, could be less, based on the above details as well as your accommodation choices. Budget trips where you stay in shoddy accommodations, eat crap food or self-drive just aren’t worth going all the way to Africa for. There’s also a level of safety (for you and your belongings) that comes with nicer camps and guides, too. We don’t recommend budget safaris for photographers traveling with nice equipment. And if you’re a luxury traveler – you’ll be in amazing hands. These guys are used to catering to clients that include presidents of other countries, billionaires, professional athletes, and celebrities. They’ve arranged tours that start at $70,000 per person, so if this is the level of service you need, they know all the best camps and managers to make your stay as seamless as possible, too. There are basically three main types of accommodations: lodges, semi-permanent tent camps, and luxury tent camps. We don’t do pitch-a-tent safaris and we don’t recommend you do them with your equipment either. You can expect nice, private bathrooms inside each tent, four poster beds, tables and nightstands, large sinks, hot water bottles at the foot of your bed to warm the sheets, and bottled water… some will have chandeliers and expensive rugs and furnishings. They’re all typically very well decorated and most have large charging docks where you can plug in camera batteries, laptops, and phones if you bring adapters. 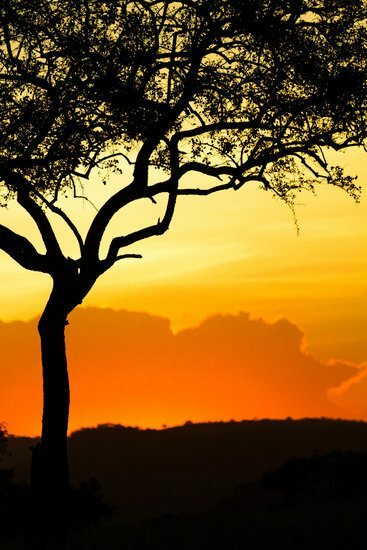 Lounges typically have Wi-Fi, cold beer, wine, and a full array of liquors, plush pillows, fancy rugs, and some even have TV (or what they call “Bush television” which is an amazing campfire and sunset dotted with giraffe, cape buffalo, and elephant). The food at night is spectacular and usually includes a variety of meat, vegetables, and starches like couscous or potatoes. Curries are popular, as are lentils. And soup is served before almost every meal (amazing soup — and every day it’s different!). All meals are included in your overall costs but drinks – outside of coffee in the morning and water in your room and in the car – are not. If you choose to stay in luxury tent camps, then all your drinks are included as well. It’s not safe to walk around at night by yourself, due to the animals. But these camps always have someone on standby to walk you one place or another if you need to go somewhere. During the day, while predators are resting, it’s perfectly safe to walk around camp. I’d feel comfortable bringing my kids to these places, and I will when they’re a little older. And make sure you say you’re with Great Escape Publishing. He’ll give you a good rate and take you to all our favorite places.